Strickland: "Just as safety protocols had to be developed and updated for internal combustion engines, so too are we working to do the same with vehicles using this new propulsion system." Government and industry leaders today gathered in Washington, D.C. for a technical workshop hosted by the National Highway Traffic Safety Administration to discuss a wide breadth of safety and regulatory issues pertaining to electrical vehicles. The conference comes on the heels of several high-profile investigations that NHTSA has launched into fires possibly caused by lithium-ion batteries in electric vehicles. The agency announced today that it is conducting a preliminary investigation, or "field inquiry," of a garage fire in Texas that scorched a Fisker Automotive Inc. Karma -- the startup company's $103,000 plug-in electric sedan. 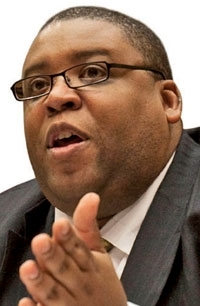 NHTSA Administrator David Strickland said in a statement that the agency hosted a "robust dialogue" as government agencies, battery makers, automakers and safety personnel discussed new research, regulations and other issues pertaining to electric vehicles. In his prepared remarks, Strickland said lithium-ion batteries present different safety and regulatory issues than typical internal-combustion engines. "Just as safety protocols had to be developed and updated for internal combustion engines, so too are we working to do the same with vehicles using this new propulsion system," Stickland said.